Team Cali Cosmo CAN hasn't added a story. To create a vibrant hub of women who are educated, employed, socially and politically active, and committed to helping other girls follow in their footsteps. Our wholistic model supports a girl from the time she leaves primary school, until the day she gains meaningful employment. Our activities are currently focused in Kenya and northern Uganda. We Build: our long-term school partnerships ensure infrastructures continue to support growth and provide a dynamic and safe learning environment. 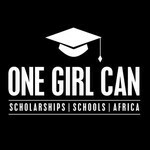 We Educate: we provide secondary and university scholarships for girls with the greatest need and highest potential. We Mentor: together with our volunteer team of professional African women, we empower girls to achieve their potential through our series of mentoring workshops. Team Cali Cosmo CAN hasn't posted any updates yet. Join Team Cali Cosmo CAN in making this campaign a success. Together we can do good for the cause we believe in.